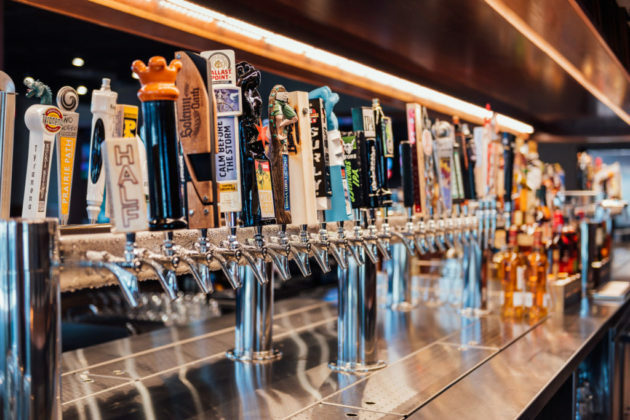 (Updated April 12) It’s been a year of expansions for City Works Eatery and Pour House — from Boston to Disney World — with a new Tysons location at the Capital One Headquarters right in the middle. The City Works is planned to open at 1640 Capital One Drive North sometime next month, next to the recently opened Starbucks and the recently canceled Taco Bamba. The restaurant’s menu is focused on classic American food and drinks, with 90 draft beers and eight wines planned for the bar. 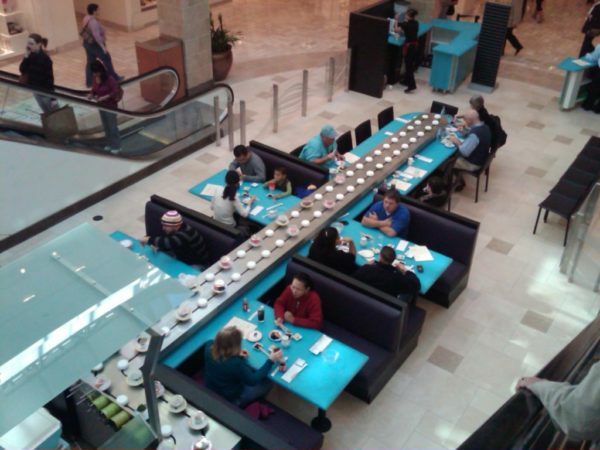 According to the Tysons location’s website, the new restaurant will be over 12,000 square feet of indoor and outdoor dining spaces. “We enjoy sharing our love of sports and music, and plan to show an array of events on our 24 flatscreen HDTVs with state-of-the-art audio,” City Works said on their website. 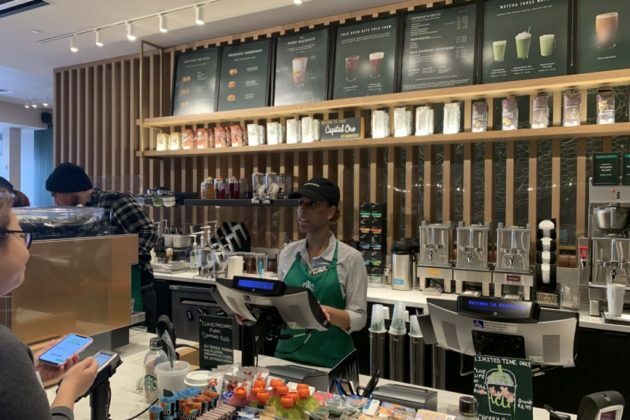 (Updated 10:50 a.m.) The Starbucks in the Capital One building (1600 Capital One Drive) is now officially open. According to an employee at the Starbucks, the location has been open for a little less than a month. 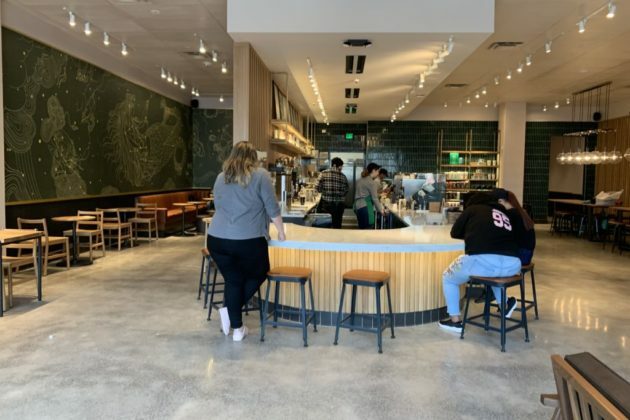 The news will likely come as little surprise to employees at Capital One, who seem to be frequenting the establishment so much that many of the baristas are on a first name basis with the customers. 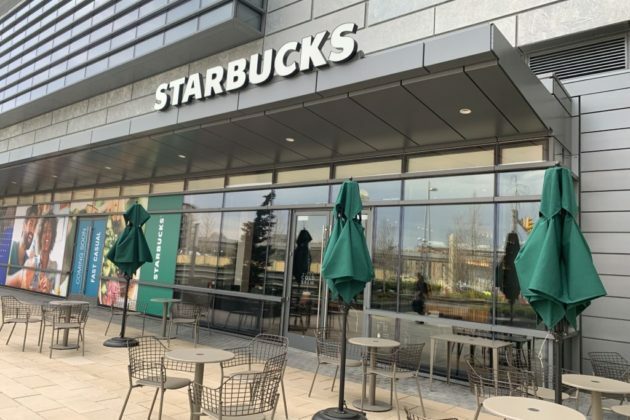 For those who don’t work at Capital One, that there’s another Starbucks open in the area may come as a bit of a surprise — there was no fanfare around the opening and the storefront is hard to see from the McLean Metro station, given the construction of the forthcoming Wegmans building. 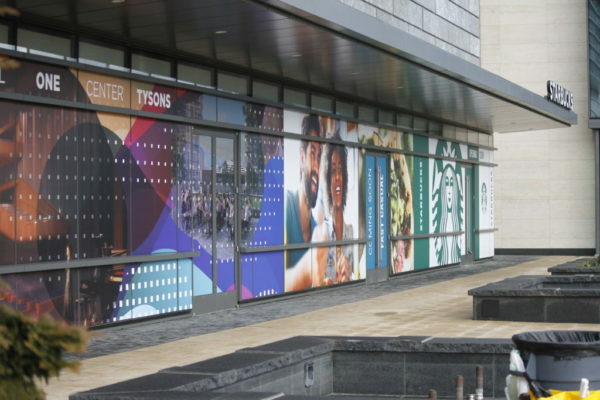 There are now ten Starbucks in the Tysons area, including two in Tysons Corner Center mall. The Capital One Starbucks is the second in Tysons East; the other is inside the Safeway at 7401 Colshire Drive. 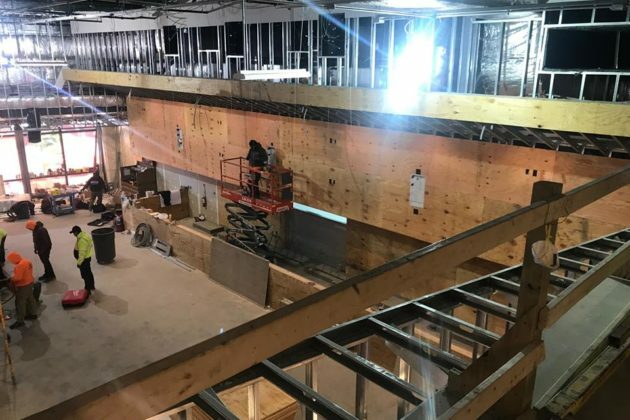 The City Works Eatery and Pour House along Capital One Drive next to the Starbucks are still currently under construction. 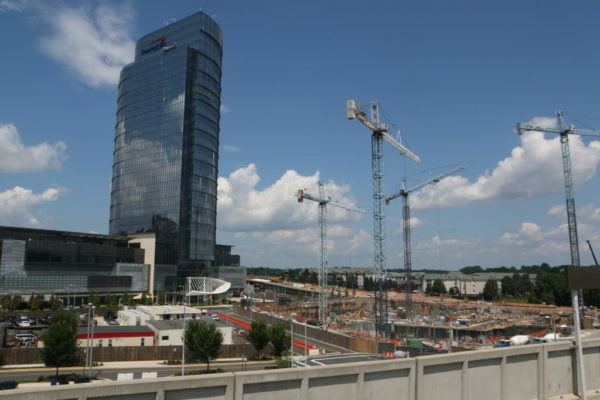 Tysons is quickly becoming one of the largest contributors to, and one of the largest demands on, the Fairfax County budget. The FY 2020 Fairfax County Advertised Budget, presented at a Board of Supervisors meeting today (Tuesday), was met with praise from supervisors for keeping the county steady without raising the tax rate. The budget will maintain the real estate tax rate of $1.15 per $100 of assessed value. The average Fairfax resident will see their tax bill increase by approximately $149. But the county still experienced $162.83 million in revenue growth at the current 3.04 percent tax rate, much of which was driven by growth in Tysons. 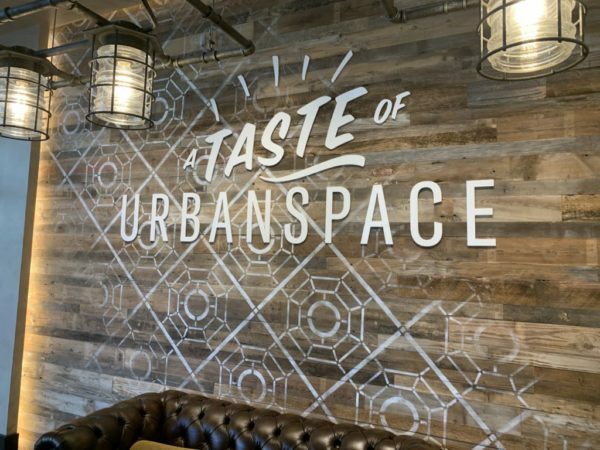 Lease rates for new space are adjusting to market conditions as many tenants are taking advantage of favorable rates, and others are looking to capitalize on market conditions by consolidating operations in newer space near Metro stations. 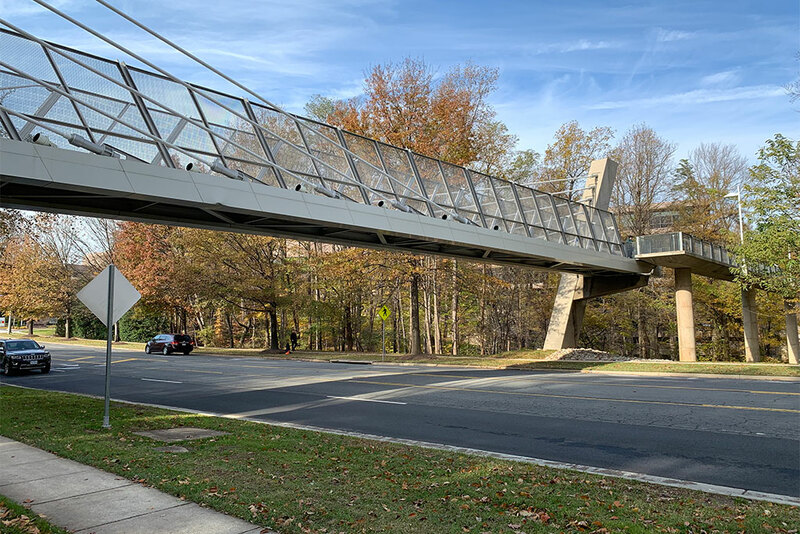 Submarkets along and near the Silver Line – Tysons Corner, Reston and the Herndon area – are especially well-positioned to take advantage of this trend. More than 54 million square feet of new office space is in the development pipeline countywide. But the budget documents also show some of the demands Tysons is putting on the budget. The report said that the department’s five-year staffing plan will include meeting the urbanization demands in Tysons with expanded police services. The budget has 16 additional uniformed positions planned for FY 2021 in the county’s long-term staffing plan. One area of disappointment from supervisors was the lack of funding for body-worn cameras. 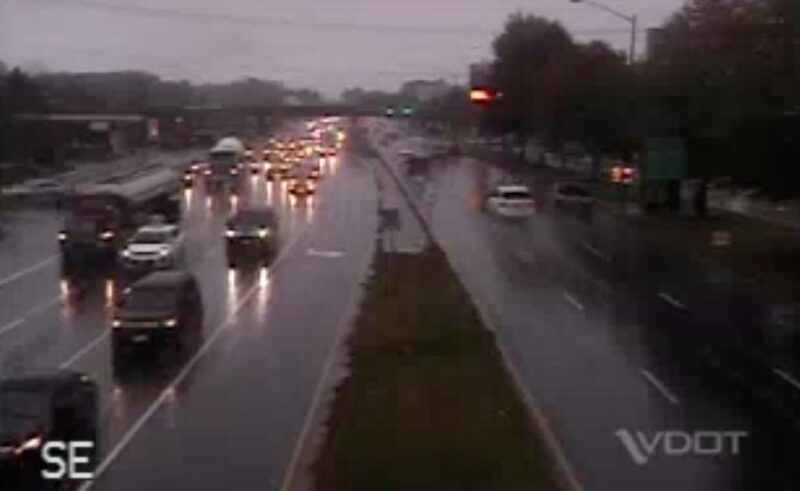 A pilot program was implemented through 2018 and a report on the findings is expected in the first quarter of FY 2019, but officials expressed concerns that the program was not in the police budget for FY 2020. Collectively, the major rezoning applications approved in Tysons since 2010 generate a need for eight new athletic fields under the maximum approved development levels. The equivalent of two athletic fields have been built and currently serve Tysons area users. The budget does note, however, that new athletic fields have been proffered — funded by developers as a condition of approval — including a baseball diamond near Westgate Elementary School and a 2.3-acre park near the Tysons Galleria. While the growth in Tysons is likely to put some strain on Fairfax County Public Schools, plans to address that overcrowding are currently not funded. Each supervisor said they will be holding budget meetings in their communities over the next few weeks. Supervisor John Foust from the Dranesville District said the McLean discussion will be held on Feb. 28 at the McLean Community Center at 7 p.m. The budget is scheduled to be adopted on May 7. It’s a new week with a new crop of job opportunities opening up in Tysons, with management positions available in everything from cybersecurity to opera. We are looking for passionate and operations-savvy Assistant Manager to oversee A Taste of Urbanspace. You will be the [general manager’s] right hand, liaising with vendors and the rest of the in-house team to ensure a superior guest experience through smooth daily operation and quality facilities maintenance. For those looking for a different sort of management position, Capital One is looking for a manager in the Transformation and Optimization Team. This work would primarily involve handling security operations, engaging vendors, and working closely with the intelligence and security operations teams. Applicants should have experience working in cybersecurity technology with either a bachelor’s degree or military experience and several years of experience in various IT or system analysis fields. An MBA or Master’s degree are preferred. For those looking for a more artistic type of management, the Wolf Trap Foundation for the Performing Arts is looking for an assistant director for artistic operations, particularly for opera and classical programming. The assistant director would help manage classical programming activities at the Filene Center as well as managing the opera operations, from auditions to managing artistic housing. There’s several job openings related to animal care. PETCO in Vienna is looking for a dog trainer or dog trainer apprentice for those interested in enhancing communication and teamwork between dogs and their owners. An aquatics specialist is also needed to provide care and aquatic life education to prospective owners and to care for the animals. Meanwhile Dogtopia in Tysons is looking for a general manager, a front desk coordinator, sales manager and canine coach. Among the job benefits are that dogs are always allowed to come to work. Babysitter — A sitter is needed for morning work in Vienna from 6-9:15 a.m., Monday through Friday with every other Friday off. The job would include getting a 2 and 8 year old dressed and ready for school, making breakfast, cleaning dishes, light room cleaning and driving the children to school. The job would pay $15 per hour and starts in early January. Pilates Coordinator — Equinox is looking for applicants to help manage pilates sessions at their studio in Tysons Corner. Applicants must be certified in Pilates training and have experience in customer service. 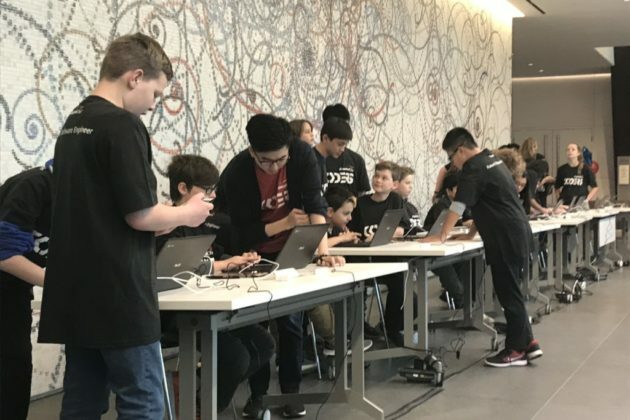 After School Chess Instructor — Chess Wizards in Vienna is looking for tutors to teach elementary school students the fundamentals of the game. The work is part time, paying $60-65 per hour with between 1-5 one-hour classes per week. Instructors will need experience in maintaining an organized and ordered classroom and an ability to make chess fun. 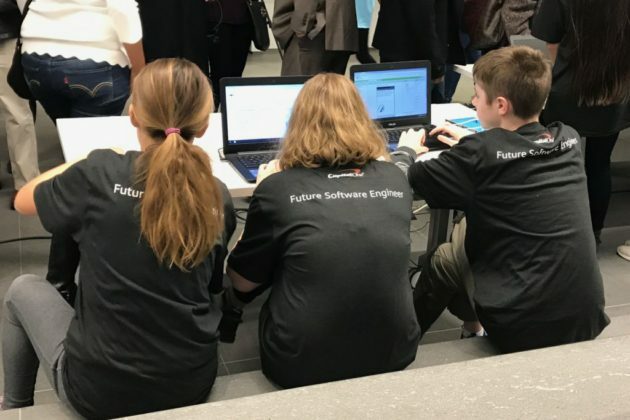 After School Minecraft Instructor — Fairfax Collegiate is offering courses teaching students basic engineering and programming, either through Lego robotics or Minecraft. Instructors in these classes should have at least one year of college experience, experience in the course material, and ideally experience in handling younger students. The job is part-time and pays $45-50 per hour. Additionally, several of the Alarm.com jobs from last week remain open to applicants. 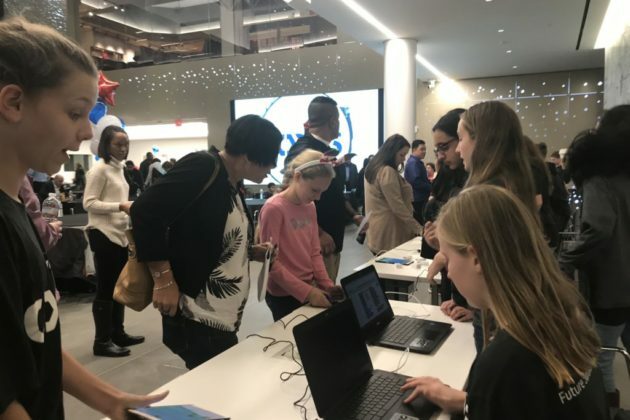 The 85 students from four Fairfax and Falls Church public schools expected to graduate yesterday from the Capital One Coders program at the Capital One headquarters in Tysons East. What they weren’t expecting were free laptops given away by the company to each of the graduates. 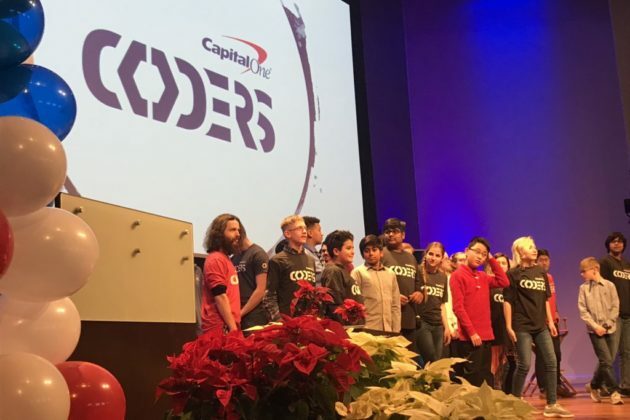 The Capital One Coders program trains local middle school students after school for ten weeks. Students learn the basics of programming and eventually work up to developing their own mobile applications. Part of the surprise at the graduation was gifting each student their own laptop and giving a $10,000 grant to the schools for STEM education. The kids went home with the laptops, but the grants will go to the schools at the end of the spring semester. Sanne said the coders program is part of a commitment to building a 21st century workforce with technology skills. Typically students develop games, although Sanne said the applications students build are often pretty sophisticated. 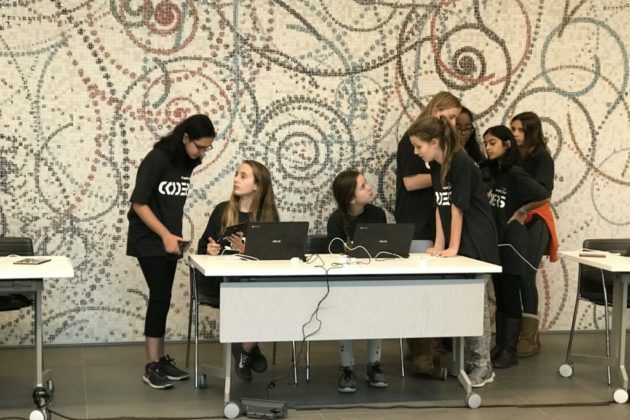 Sanne noted there was one student early in the program who developed a mobile application to automate her family’s chicken coop so she wouldn’t have to leave the house to open up the coop and let the chickens out. 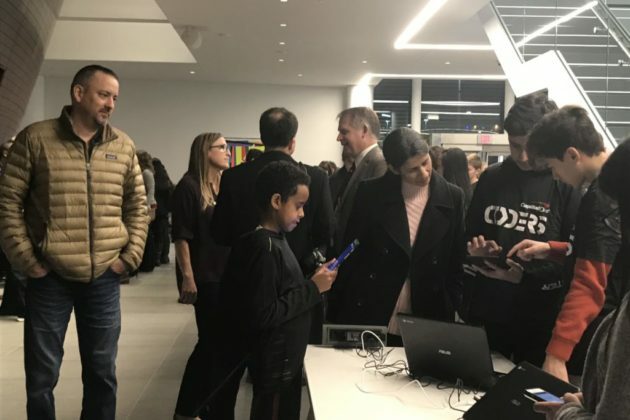 At the graduation, the students at the Capital One Coders program also demonstrated their apps for parents and loved ones in attendance. Different prizes were awarded, like most creative or most technical.